There are two mechanical designs found for the 50mm "Knee" Mortar HE round. The more common (lower right) having a one piece upper body with open base and threaded base plug. The other has a one piece lower body with threaded nose cap. It seems that both designs were produced more or less concurrently. The propellant "cup" is the same for both. Here is the propellant cup section. 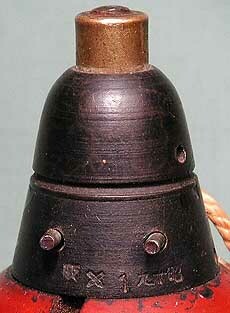 The Model 89 Mortar had a rifled barrel, which spun the projectile for stabilization. The round was a slip fit, loaded into the tube from the muzzle. The copper can would contain the propelling charge in a donut shaped bag. The primer located at the center hole was fired by a simple cocked firing pin system. 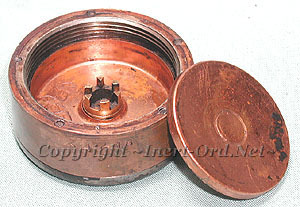 When fired, gases would vent out the bottom as well as through holes in the sides expanding the soft copper band, pressing it into the rifling. A unique design. There are three paint schemes found for the HE types. The red marking band at the top was used by the Army, but the Navy used green. Don't know why as they are all HE rounds. The white strip was an earlier marking pattern. One minor note about the round on the right. The ink-stamped filling date (18.4) is April 1943, but the metal stamping on the body is 1939. I assume the yellow & white stripes were painted when the round casing was fabricated, not when it was loaded. 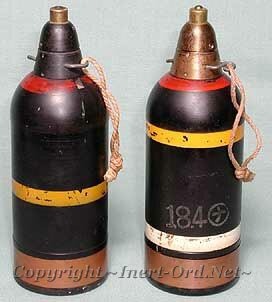 By far the most common fuze is the brass one show at left, marked "88 Model" (Type). An interesting Type 88 Fuze is the steel variant show at the right. Not to be confused with blackened brass types sometimes found. It has no "Type 88" marking. One collector has written me and has seen examples of these dated as early as 1943. 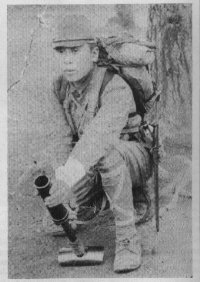 This one is dated Showa 19.1 (January 1944). Any further information about this steel fuze would be appreciated ! 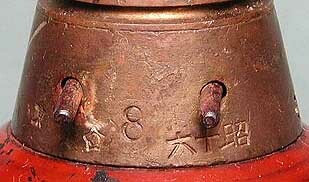 All Type 88 fuzes appear to be marked at the base. There are two symbols to the left of the numeral, which are arsenal stamps, followed by the date. Stampings on the body typically have the date as well, and sometimes a serial number. On rounds with removable noses, it appears there is a matching serial number on that part as well. This one is dated "16.11" (Nov 1941), followed by the serial number. 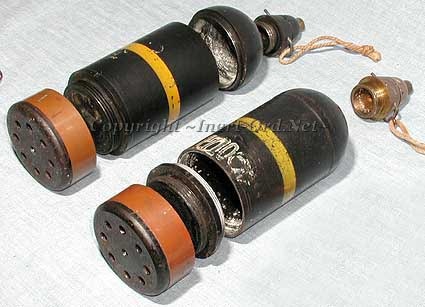 The mortar rounds were shipped with a Bakelite fuze plug and the fuzes were packaged separately in tin cans. 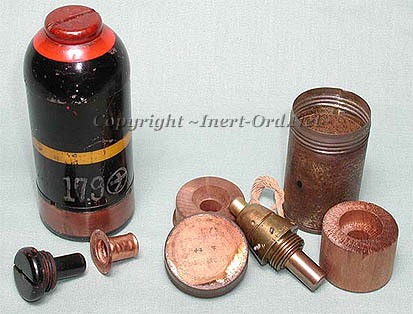 The fuzes also came packed in large wooden boxes with shelves with holes that the threaded end went into. The mortar round has a red fuze plug. 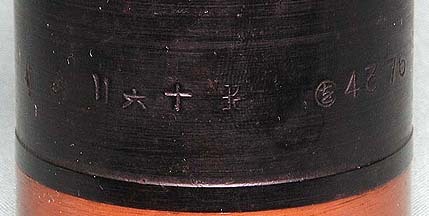 The Bakelite itself is red, with Kanji (or Kana?) markings on top. 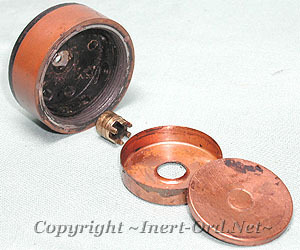 In front of the round is a black, unmarked fuze plug. 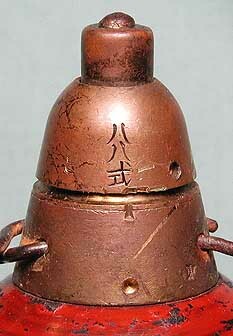 The little "top hat" is the fuze well, which was set in the top of the HE filler. See my page about this fuze.